The buildings along the highway from Tirana to Fier (the larger town gateway to ancient Apollonia, Albania) are very evident due to their colourful and ultra-modern facades, but for some reason, they all seem to be half-finished. We couldn’t make out whether construction was still ongoing or whether they had been abandoned before completion. The road from the centre of Fier to ancient Apollonia was more of a cart-track riddled with pot-holes and bunkers, besides being full of trash, so we had to stop people a few times to ask them if we were going in the right direction (forget using a GPS or Maps here!). Eventually we got to a large field with grazing sheep and cows and a sign saying Apollonia but with no sign of the ruins. The entrance was actually about a hundred metres up the road and we were charged 400 lek (about Eur 3) to get in. 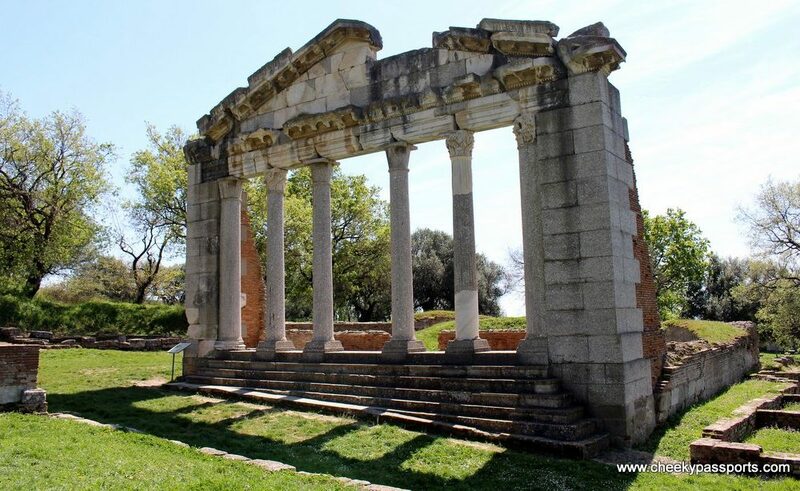 Apollonia, a tentative candidate for the UNESCO list, was an ancient Greek city in Illyria (part of which is now modern-day Albania) initially founded by colonists from Corfu and Corinth. 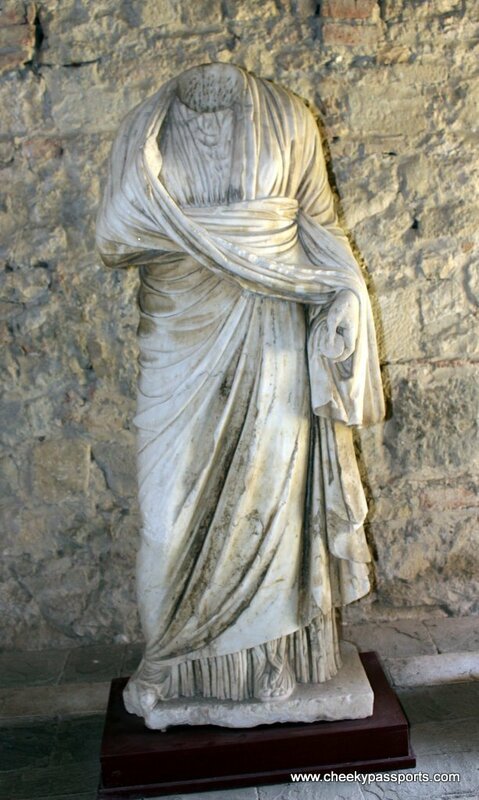 The city flourished during the 4th century AD within the Roman Empire when it became renowned for its beauty. Following an earthquake it fell into decline and was abandoned. We were the only people visiting the site. 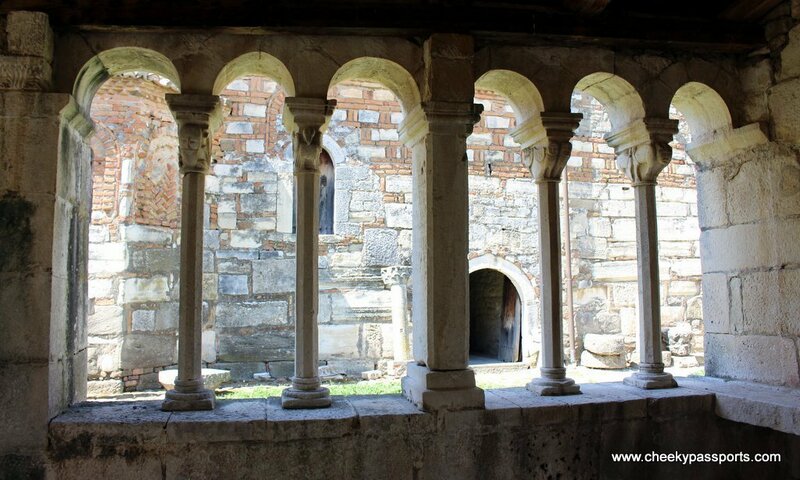 The museum is located inside what was previously a monastery and contains several statues and relics. 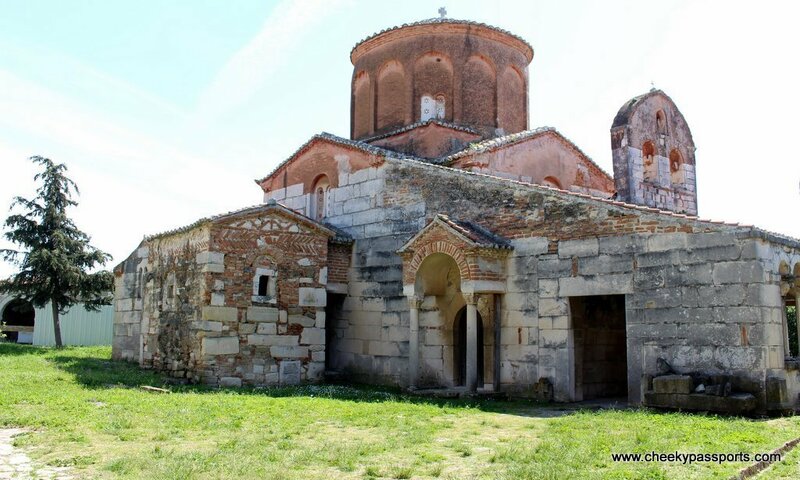 Close by the monastery are the monuments, most notably the monument of Agonothetes and the Odeon. The deserted archeological park made for a pleasant late morning walk. As we were making our way back to the entrance we noticed four men having a picnic in the shade of a tree. They called us over as soon as they saw us and, although a bit wary at first, we approached them out of curiosity – and what a good decision that was! We experienced here true Albanian hospitality with some of the friendliest locals ever who had us clutching plates and plastic cups within seconds. We politely indicated that we didn’t want to intrude and that we should be on our way but they weren’t having any of that. 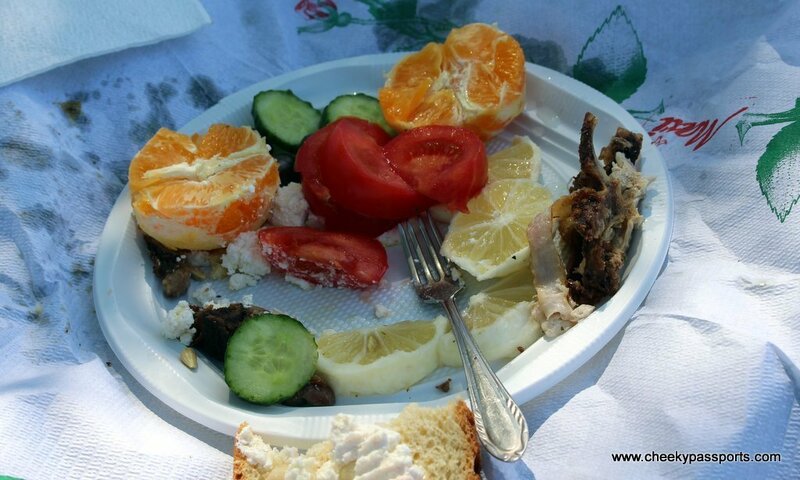 Picnic baskets were opened and containers and bags of cooked pork, fried fish, cheese and fresh garlic, chunky tomatoes and cucumber, shiny black olives, bread, boiled eggs, oranges and lemons were brought out. And homemade red wine. Lots of wine. It was difficult to show our appreciation since we could not find a common language to communicate in, but luckily they knew a spattering of Italian and suddenly we were all shouting out “bello bello” to each other, a phrase which at that point, took on several meanings. 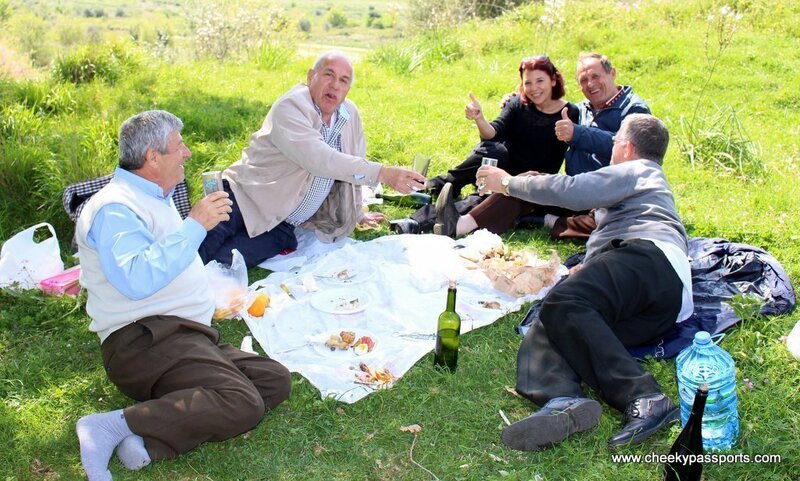 As the wine flowed, the four of them tried to have different conversations with us at the same time (in Albanian) whilst also interrupting each other, presumably to correct something the other said. We understood nothing but happily smiled away as we enjoyed the breeze and sipped on the delicious wine. Because we still had a long way to drive, Nikki pointed out to our hosts that he should stop drinking but they firmly filled his cup many times over instead, whilst mumbling something about no police. That meant that I got to have his share too. It was getting late and we tried to leave several times but we were pulled back down and told off each time. And each time, our plates and cups were refilled. 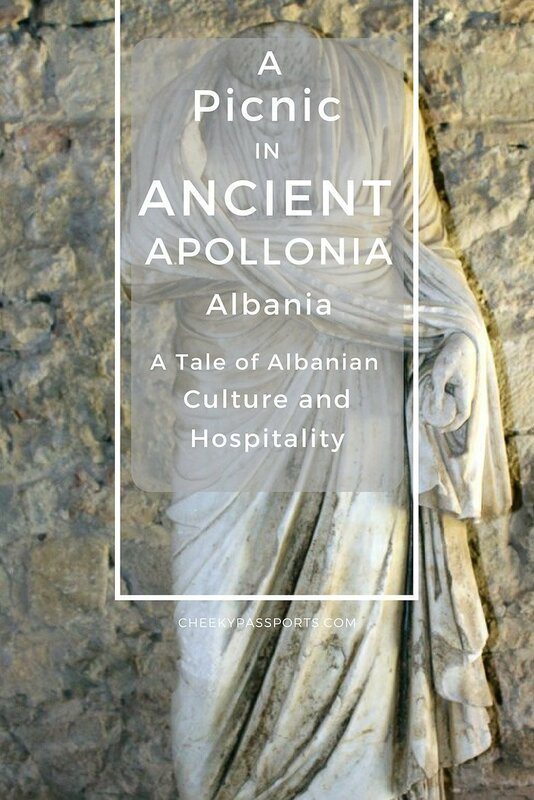 I’m not sure how we managed to get away, but as I stumbled across the park and almost pulled down one of the ancient monuments, I could only think about how this unexpected show of hospitality had us already feeling at home in Albania. I slept the whole way to our next destination.